PT Angkasa Pura II (Persero) - Angkasa Pura II or referred to as "Angkasa Pura 2 Group" is a leading state-owned airport management services company in Indonesia. Angkasa Pura 2 Group engaged in airport services and related airport services. Based in Jakarta, Angkasa Pura 2 Group now has 13 branch airports in the western part of Indonesia. The Company's airports consist of Soekarno-Hatta International Airport Jakarta, Halim Perdanakusuma International Airport (Jakarta), Husein Sastranegara International Airport (Bandung), Kualanamu International Airport (Medan), Supadio International Airport (Pontianak), Minangkabau International Airport (Padang), Sultan Mahmud Badaruddin II International Airport (Palembang), Sultan Syarif Kasim II International Airpot (Pekanbaru), Sultan Iskandar Muda International Airport (Banda Aceh), Raja Haji Fisabilillah International Airport (Tanjungpinang), Sultan Thaha Airport (Jambi), Depati Amir Airport (Pangkalpinang) and Silangit Airport (Tapanuli Utara). As of December 2015, Angkasa Pura 2 Group supported by 1 subsidiary and 3 affiliated companies, namely PT Angkasa Pura Solusi (99.995 shares ownership), PT Railink (40%), PT Gapura Angkasa (31.25%) and PT Purantara Mitra Angkasa (0.134%). In term of financial performance, Angkasa Pura 2 Group posted positive financial performance in 2015. 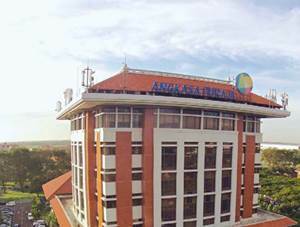 According to PT Angkasa Pura II (Persero) Annual Report 2015 as cited by JobsCDC.com, Angkasa Pura 2 Group managed to record revenue of Rp 5,644.15 billion in 2015, an increase of 16.12% from the previous year of Rp 4.860.51 billion. Total net profit in 2015 continue to grow by 49.74% to Rp 1,687.32 billion from Rp 1,126.77 billion in 2014. Background in Master Degree (S2) and possess Accountant degree. Minimum 5 years of experience in the field of Audit and/or Good Corporate Governance (GCG). Able to conduct business activities and financial reports analysis . Minimum 5 years of experience in the field of Risk Management and/or Human Resource (SDM). Able to conduct corporate risk management analysis and formulating the company's risk maps to any corporate actions undertaken by the company. Preferably domiciled in Jakarta and its surrounding. Able to work part time. Able to conduct examination and analysis tasks. Have a good track records based on a letter from the agency / agencies concerned have worked. Submit a letter of application and curriculum vitae. Submit work plan proposal including salary expectations. JobsCDC.com now available on android device. Download now on Google Play here. Please be aware of recruitment fraud. The entire stage of this selection process is free of charge. 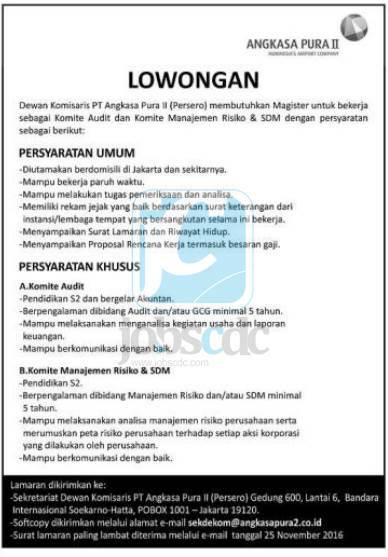 PT Angkasa Pura II (Persero) - Audit Committee, Risk Management and HR Committee AP 2 Group November 2016 will never ask for fees or upfront payments for any purposes during the recruitment process such as transportation and accommodation.